"Civility Costs nothing and Buys Everything"
place in the car. When the rest of the family joined, he would insist on sitting in the same place and then literally fight with his sister for his personal space. It was an interesting observation and reminded me of our foreign student orientation at Indiana Institute of Technology as a freshman back in Spring of 1991. We were a group of about ten students, all from South East Asian background. The concept of the gathering was to familiarize us with the cultural aspects of American Culture with a lot of emphasis on personal space. It was our first week in the United States of America. While our instructor talked about personal space, we all looked at each other while we rolled our eyes as it was an absolute alien concept for us. Personal Space? Now what in the world is that? Only to realize later in personal and professional life that we all have a personal space, no matter from what culture or background we belong to. It's just that most of the time we don't pay too much attention to it, especially in South East Asian part of the world. However the amount of personal space varies and is dependent upon what part of the world we are in. We as humans, define and guard our personal space. When our personal space is violated, it results in a feeling of discomfort, anger, frustration and sometimes violence. To take it a step further, even in the animal world, the personal space is defined as "territory" and is guarded jealously. As I exited on the main road that day with my family, suddenly a car pulls in front of me and gives me a feeling of anger as if someone has intruded into my personal space. In this scenario, my car and the predefined space in front of me in my mind is my personal space. Though I keep my calm, but the feeling is once again the violation of my personal space. We reach the restaurant where we frequently dine in and subconsciously I am looking for the table that we usually occupy. I figure that it is occupied, but we are seated by the waiter at another closer table. Since am used to sitting at the specific table, subconsciously I have claimed ownership of that table and space. Once seated, we all five family members subconsciously divide the table in five parts and we all claim our personal space on the same table. So a sense of personal space is inbuilt in all humans as their nature. I had a chance to visit a government official today in his office to drop off some personal documents. As I sat across his table while he was briefing his assistant and I was observing his office closely since he had returned recently from overseas, I noticed his family picture in a frame on his desk. Though an uncommon practice in this part of the world, the family picture depicts his ownership and claiming his office and the desk as his personal space. The bubble of personal space varies from culture to culture. While the personal space bubble is much bigger in America and Europe, it's much smaller in France and the Middle East. You can literally offend an American by getting too close to them whereas in France and Middle East or Latin Americas, the bubble is small, but still exists. According to Dr. Edward Hall, the personal space between two people tell and define their level of relationships. It varies with each culture. According to American Standards, Dr. Hall divides the personal space into four zones. He refers to the first one as "Intimate Zone". It represents an area sixteen to eighteen inches from our bodies. To enter this space is highly selective and anyone other than our partner, family, relative or close friend is restricted. He calls the next Zone as "Personal Zone" which is approximately one and a half feet to four feet from our body. Such space is reserved for friends and acquaintances. The third zone he refers to is the "Social Zone". The distance for this zone he says is from four feet to twelve feet away from your body. It's a distance you keep for repairmen, strangers, new employees at work and such. The fourth zone Dr. Hall defines is the "Public Zone" where the space is twelve feet or more where he gives a typical example of a speaker addressing a group. 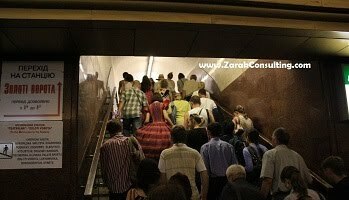 Similarly in group situations in America, such as in a crowded elevator or a concert where personal space cannot be maintained, there are unspoken laws for such situations. You find most people staring at the floor in an elevator or avoiding eye contact during a concert. Starring at others is considered extremely offensive and against etiquette. It is interesting to look around in our daily lives how each one of us try to guard and protect our personal space, and most of the time are not aware of it while safeguarding it. Even more important, are we violating the personal space of others and are not even aware of it?